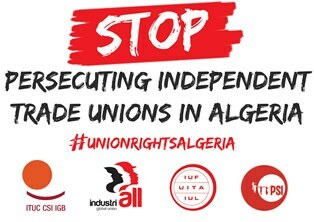 Last year, the Committee recommended that an ILO mission visit Algeria to investigate the situation of independent unions in the context of the long history of government violations of Convention 87 on freedom of association. The planned mission had to be cancelled in February this year when the government refused to include meetings with independent unions as part of the mission. In its report this year, the ILO expressed its ongoing concern over "the persistence of restrictions on the right of workers to join and establish trade union organizations, federations and confederations of their own choosing" and called on the government "to accept without delay, and before the next meeting of the Committee of Experts, an ILO high-level mission without restriction." Speaking at a government press conference on June 12, the minister attacked by name Rachid Maalaoui, President of the public sector union SNAPAP and Raouf Mellal, President of the electricity union SNATEG, for fomenting an ILO campaign against Algerian sovereignty in an attempt to undermine the country's 'stability'. Mellal, who has already been sentenced to 18 months in prison and punitive fines for denouncing corruption and defending a victim of sexual harassment, faces yet another round of prosecution on new, spurious charges. The government has persistently attempted to illegally dissolve SNATEG, and the Autonomous General Confederation of Workers in Algeria (CGATA) has been waiting in vain for formal legal recognition since 2013, a procedure which according to law requires no more than 30 days. Hundreds of union members, officers and activists have been dismissed from their jobs, union offices closed and union demonstrations brutally attacked by the police. SNAPAP and SNATEG are affiliated members of the IUF.